John Gunther and Eurowest Bloodstock's Take These Chains (IRE) was made the 3-1 lukewarm morning line favorite for Saturday's $75,000 Blushing K.D. Stakes, a 1 1/16-mile event for fillies and mares on the Stall-Wilson Turf Course which is one of six stakes events scheduled for Santa Super Saturday, Dec. 22 at the Fair Grounds. Breaking from the rail is Darrell and Sadie Brommer's Prado's Sweet Ride, who finished third in last year's edition of the Blushing K.D. Stakes. Trained by Gary Scherer the versatile 6-year-old daughter of Fort Prado is campaigned by Chris Block during the non-winter months and owns graded stakes wins on dirt and turf. As a 3-year-old, she won the Grade III Regret Stakes at Churchill Downs over the Matt Winn Turf Course. Last time out she returned to the Louisville oval to win the Grade II Falls City Handicap over a fast main track on November 22. 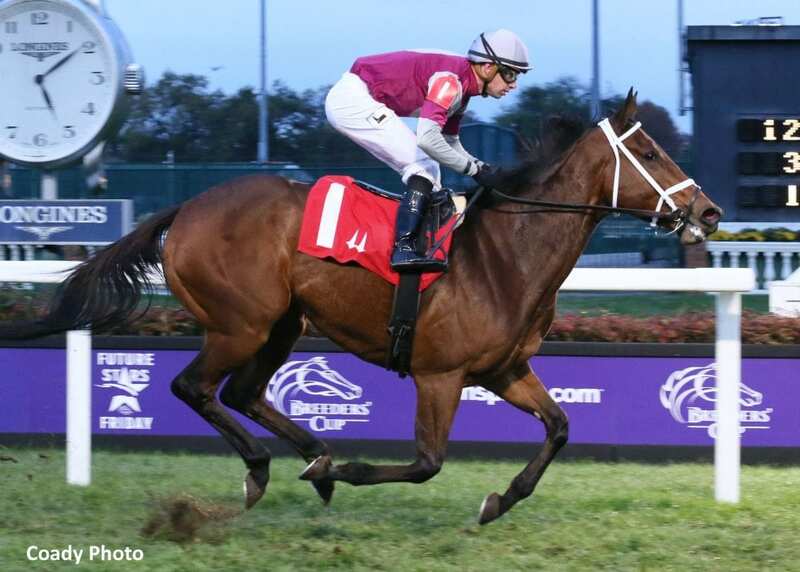 She has made five starts over the Stall-Wilson Turf Course which consist of one triumph when she took the New Orleans Ladies Overnight Stakes in April 2017. Prado's Sweet Ride has won two other stakes races which occurred in the Minnesota H. B. P. A. Distaff Stakes at Canterbury Park in August 2016 and the Illini Princess Stakes last November at Hawthorne against fellow Illinois-breds. She will be ridden by Jose Valdivia, Jr. at morning line odds of 6-1. Qatar Racing Limited and Hunter Valley Farm's Dubara (GB) breaks from the four hole and is still in search of her first win in the United States. In four starts in America, the 4-year-old daughter of Dubawi (IRE) has seen some near misses against stakes caliber. Her United States debut was a third-place finish in the Ellis Park Turf Stakes at its namesake track on July 8, where she was beaten a half-length. Her next start was a fourth-place finish in the One Dreamer Stakes at Kentucky Downs, where she finished three-quarters of a length behind On Leave. Trainer Brendan Walsh is making an equipment change for Saturday's outing and will have Dubara sporting blinkers for the first time. She will be guided by current leading rider James Graham. Rounding out the field are I'm Betty G (post two, 4-1, Ricardo Santana, Jr.), Vagabond Princess (post three, 8-1, Jack Gilligan), Nineteenth Street (post five, 20-1, Adam Beschizza), Full of Zip (post eight, 30-1, Mitchell Murrill) and Superioritycomplex (IRE) (post nine, 9-2, Joe Bravo). The Blushing K.D. Stakes is named in honor of James and Sue Burns' Grade I Kentucky Oaks winner in 1997, who was a three-time stakes winner at Fair Grounds prior to said victory. Trained by Sam David, Jr., Blushing K.D. won the Fair Grounds Sales Derby, Davona Dale Stakes and Grade III Fair Grounds Oaks and went on to win the Grade II Monmouth Breeders' Cup Oaks in the final start of her career. Earlier on the card, John Wentz's Wynn Time will attempt to continue his consistent record when he tries turf for the first time in the $75,000 Bonapaw Stakes, a 5½ furlong event for 3-year-olds and upward. Trained by Hugh Robertson, the 4-year-old Illinois-bred son of Three Hour Nap has never finished off the board in nine career starts, which include a trio of allowance victories over the local main track as well as a stakes victory in the Thanksgiving Handicap last time out. His other two starts against stakes company both took place at Oaklawn Park behind Whitmore when finishing second beaten a neck in the Hot Springs Stakes on March 10 and third in the Grade III Count Fleet Sprint Handicap on April 14. Marcelino Pedroza has been aboard Wynn time for all of his Fair Grounds victories and will retain the mount for Saturday's race. He will break from post two as the 2-1 morning line favorite. Looking to turn the tables on Wynn Time is Sheikh Rashid bin Humaid Al Nuaimi's Switzerland, who was third behind Wynn Time in the Thanksgiving Handicap. The 4-year-old son of Speightstown is a two time Grade III winner on the main track and took the Maryland Sprint Stakes at Pimlico on May 19 and the De Francis Memorial Dash Stakes on September 22 at Laurel Park for Hall of Fame trainer Steve Asmussen. The Bonapaw will be Switzerland's second start over grass. While under the care of former trainer Chad Brown, he raced as a maiden over the Saratoga turf and finished fourth. He boasts the highest amount of lifetime earnings with $447,904. Switzerland will be ridden by Ricardo Santana, Jr. and breaks from post seven as the 3-1 morning line second choice. Latent Revenge (post one, 12-1, Gabriel Saez), Kid Perfect (post three, 8-1, Adam Beschizza), Balandeen (post four, 8-1, Florent Geroux), Win Lion Win (post five, 10-1, James Graham), Kitten's Cat (post six, 5-1, Shaun Bridgmohan), Savage Battle (post eight, 12-1, Jose Valdivia, Jr.) and Fort Fortitude (post nine, 10-1, Joe Bravo) round out the field. The Bonapaw Stakes is named after James and Dennis Richards' 12-time stakes winner who made $1,158,752 on the track. His big victories include the Grade I Vosburgh Stakes at Belmont Park in 2002 as well as back-to-back wins in the Thanksgiving Handicap in 2000-01. This entry was posted in Racing and tagged beau recall, blushing k. d. stakes, brad cox, fair grounds, fastnet rock, Florent Geroux, John Gunther, prado's sweet ride, take these chains by Press Release. Bookmark the permalink.